Mixbook is back to give you the spookiest deal before Halloween! 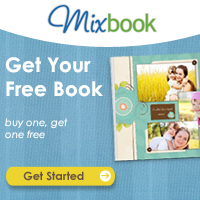 Until October 23rd, 2011, Mixbook is having a Buy One Photo Book & Get Your Free Photo Book! When you buy one photo book, you get one photo book for free. With this great offer, think of all the great memories you can share in two great photo books, for the price of one only for a limited time. Hurry up and visit Mixbook and start creating your photo books now, as this deal will disappear sooner than you know.